Flash Slideshow Maker is a dynamic 3D flash gallery and flash banner maker to make flash slideshow album with 3D theme or other beautiful flash templates. It converts photo collection to Macromedia Flash file format (SWF) that you can share photos on website or blog. It can also burn photo slideshow to CD or DVD disc playable on computer ot TV. 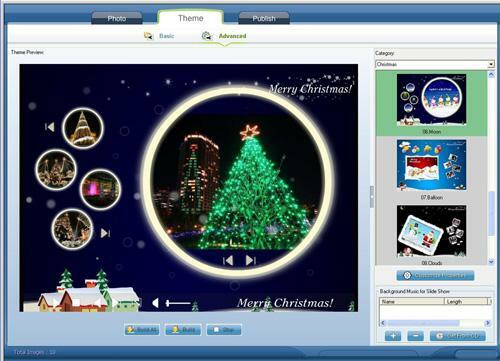 It also supplies all kinds of beautiful festival theme templates like Christmas theme flash. ...... to the flash slideshow space, where you can show your beautiful flash slideshow. With 3D Flash Slideshow Makerl, you can easily turn a folder full of still images into a dynamic 3D or other common flash slideshow album with background music and special transition effects. The 3D flash slide show software allows you to add nice looking animated and 3D slide shows to your website or blog easily. You can also use Flash Slideshow Maker Professional to make dynamic 3D or other common flash slideshow banner as the advertisement on your website. Flash Slideshow Maker also supports other beautiful festival theme templates which you can use to make all kinds of festival slideshow album, such as Christmas slideshow, Thanksgiving slideshow, Hallowmas slideshow, New Year slideshow, Valentine's day slideshow, Birthday slideshow and so on. Create professional slideshows and presentations! With video export! Create iPod photo slideshow from photos and music. Create Flash movie with various built-in resources, templates and effects. Create PDF files with your photos and pictures as Slideshow. Create Flash slideshow and Flash photo gallery with digital photos and music. Create and upload web pages in minutes without knowing HTML. Making SlideShows so easy that your grandmother could make them. Create Flash slide show and Flash photo gallery with your pictures and music. Qweas is providing links to Web Flash Slideshow Maker 5.00 as a courtesy, and makes no representations regarding Web Flash Slideshow Maker or any other applications or any information related thereto. Any questions, complaints or claims regarding this application Web Flash Slideshow Maker 5.00 must be directed to the appropriate software vendor. You may click the publisher link of Web Flash Slideshow Maker on the top of this page to get more details about the vendor.